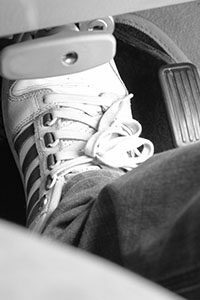 Most of us take for granted that when we step on the brake pedal, the car is going to stop. And while that may be true most of the time it is always a possibility that your vehicle’s brakes could fail. This may sound a bit dramatic and alarmist but, as with anything mechanical, there is always a chance of failure. 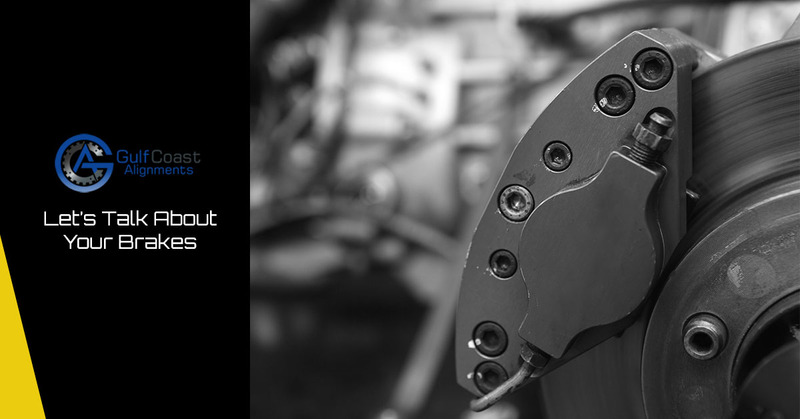 At Gulf Coast Alignments we are proud to offer brake services for cars and light trucks. Many of you may think we only do alignments but that is not the case; we have a full service automotive shop, able to perform a wide variety of services. While our alignments are performed by some of the most qualified technicians in Houston, you can bet that our brake work is just as superior. The brake system is one of the most misunderstood on most modern vehicles. Back in the old days, the brakes had little resemblance to today’s much more complicated systems. They were pretty much direct feedback and not incredibly effective. Meaning that when you pushed on the brake pedal, it was exerting the same amount of energy to the brake itself. Not very effective when trying to stop a vehicle that weighs thousands of pounds. The brake configuration back in the old days was a drum style, consisting of two pads that push out onto a drum inside of the wheel. This system is effective but is heavy and subject to overheating —when brakes overheat they fade or stop working. Drum brakes are actuated by hydraulic cylinders just like disk brakes but they are just not as effective for passenger cars. Today’s drum brakes have benefited from changes in technology just like every other component on your vehicle. Drum brakes are much more reliable and effective than they used to be and the trucking industry uses drum brakes almost exclusively. These days drum brakes are only utilized when the manufacturer wants to keep the cost down and generally only on the rear of the vehicle. The drum/disk setup is very effective and you should not worry at all if you have this system. The next evolution in braking began with the introduction of disk brakes. If you have ever driven a classic car, you know that the braking effectiveness, when compared to today, is much different; you almost have to put your foot through the floor to stop the car. Stopping a 2000 pound car from speed, with disk brakes was a revolution in the automotive world, they performed so much better and increased the safety of the vehicle. Disk brakes work like similar to drum brakes in that they utilize the same fluid power to actuate the brake pads. The effectiveness of disk brakes is their ability to stay much more cool under heavy braking conditions than drum brakes. Performance cars have traditionally been equipped with all-wheel disk brakes as they allowed for harder braking and less brake fade. Disk brakes were expensive, but stopped the car really well and they were the standard if you were a race car driver. While disk brakes were more effective than drum brakes, they both utilized a simple hydraulic system to actuate. It worked like this: your push the brake pedal, pressure is transferred to a cylinder which moves moves fluid to the rear wheel. The pistons on the rear of the wheel apply pressure to the brake pads and if all goes as planned, the vehicle stops. The hydraulic system that controls the brakes is the most effective because, like any hydraulic system, pressure can be amplified with liquid much easier. This is the same concept that heavy excavators use when working, allowing them to lift and move extremely heavy loads. In the last 25 years or so, ABS, or Anti Lock Brake systems have become standard equipment on almost all new vehicles. ABS is a safety feature that allows the vehicle to maintain control, even under hard braking, modern ABS is connected to systems like traction control and stability control. In the old days, when you hit your brakes on an icy road, chances are you were going to skid, unless of course you could pump the brakes in just the right fashion, causing the tires to lock up and release intermittently. This is a way to control a skid and essentially what ABS does. If you have ever slammed in your brakes and heard that buzzing noise, that is your ABS system cycling your brakes at high speeds to control a skid. As vehicles get better and better, the ability of drivers to maintain control through the braking system. This type of advanced procedure requires a myriad of sensors and all sorts of computer controls. Sometimes all of this technology overshadows the fact that the braking system is still just a high friction pad gripping a disk of metal. Unlike your oil change every three months or so, your brake system does not need any additional preventative maintenance, only periodic checks of the components. The best indicator of brake issues is the brake fluid. Brake fluid is much thinner than regular oil and is designed to transfer energy efficiently to the brake calipers on the wheels. This means that the fluid should remain at a fairly consistent level. Of course as the brake pads wear, the brake fluid will drop slightly, but it should always be visible in the reservoir. Care must be taken when filling or checking brake fluid as it will absorb water. This can cause rust to form inside of the tight fitting parts on the brake system and decrease braking effectiveness. If you do notice that the brake fluid reservoir is very low, chances are you have a leak somewhere. All fluid will run to the path of least resistance (think of a river flowing through a meadow). Most of the time it is going to flow down the confines of the river bank, but if a lower section were to happen to present itself, the water would flow into that area. The same thing goes for your brake system. If there is a leak all of the fluid will eventually evacuate through the area that is compromised, rendering the brake system useless. Please come back and see us next time when we talk a bit more about your braking system. In the meantime, if you have any questions about your braking system, or any safety system on your car, please do not hesitate to contact us right away. We will do our best to get you in and back on the road as fast as possible.